I'm still busy packing and sorting things out with not much happening in the kitchen. I never knew I had that much stuff. It always amazes me how much things I manage to accumulate over time and I'm not even a horder, well not that much of a horder anyways. Preheat oven to 180C/ Gas 4. Place the peaches into pie crust. Mix 1 cup caster sugar, 1/3 cup flour with the salt in a bowl. Add the beaten eggs and sour cream and mix well. Pour the mixture over peaches. 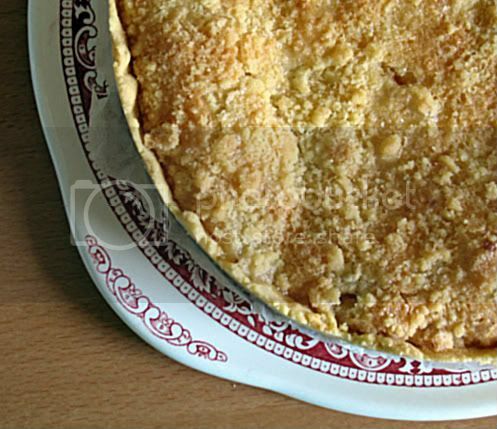 Combine 1/2 cup sugar, 1/2 cup flour and the butter until you get a crumbly mixture and sprinkle it over the pie. Bake for about one hour, until golden on top. This can be eaten warm, but I think it's even better when it has been in the fridge for a good few hours or overnight. Well, as I said things at work have gone back to normal as the term has finished and all our students have left for the summer. My life is still topsy turvy though, as I'll be moving in two weeks, which means a lot of stuff to sort out and boxes to pack, so I don't know how much I'll be around and how long I'll be without regular internet access. For now I'll share this quick, simple and light dinner with you in the hope that I'll be able to post again soon. If not please keep bearing with me. I will be back! Promise! Mix the sesame, cayenne and salt and coat the chicken on both sides. Grill the chicken either on your BBQ, George Foreman Grill or using the grill in your oven until cooked through. Times will vary, but it won't take too long as you've pounded the chicken breast fillets flat. 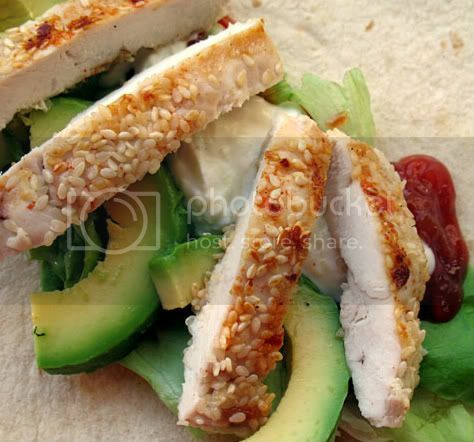 Slice into strips and divide between the warmed tortillas/wraps. Top with avocado, shredded lettuce, sour cream and salsa. Things have finally settled down a bit at work, so I'm back in the kitchen rather than living on take aways and sandwiches. Thanks to all of you for bearing with me and all the well wishes. Krautsalat has always been one of my favourites and I really can't give you a good enough reason why I have never tried to make my own before, especially as it's not available to buy here in the UK. It is so simple and really satisfied my cravings! The difference between the German coleslaw and the one you usually get in the UK and the US is that instead of a mayonnaise based dressing, it is made with oil and vinegar and it doesn't have any carrots in it either. There are loads of slight variations, but here's the recipe I used, it can easily be doubled or trebled to feed a crowd. 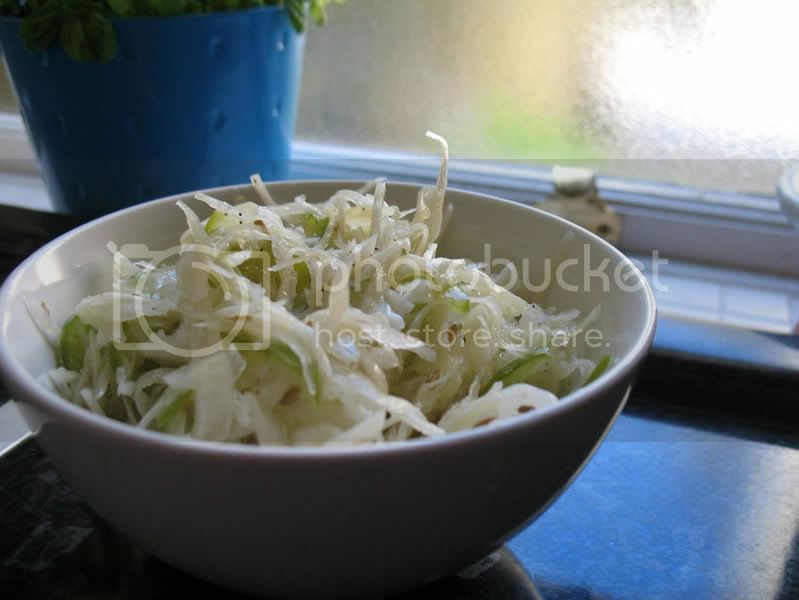 Place the cabbage and pepper in a decent sized bowl. In a pan, bring the oil, vinegar, sugar, salt and cumin to a boil and stir until the sugar is dissolved. Pour the hot liquid over the cabbage and stir well. Cover and refrigerate for at least twelve hours. 'Oh dear! Oh Dear! I shall be late!" I feel like the White Rabbit from Alice in Wonderland at the moment. I'm constantly checking my watch and wonder where time goes and how I am possibly gonna get everything done! I hope it'll be better next week! I think the best corn on the cob is done on the BBQ. Tonight was just not the night to wait for coals to heat though. There just wasn't enough time, as D. goes to a guitar class on Monday nights. So I tried a Paul Rankin recipe, that I found on the BBC food website. The corn is done on the stove top instead of the BBQ and both D. and I really liked it. Cook your corn on the cob in salted water for about 5 minutes. Drain. Heat a griddle pan to a medium heat and add the corn. Griddle for another 7-10 minutes, turning regularly. While the corn is in the griddle pan, heat the butter, lemon juice and chives in a pan until the butter has melted. 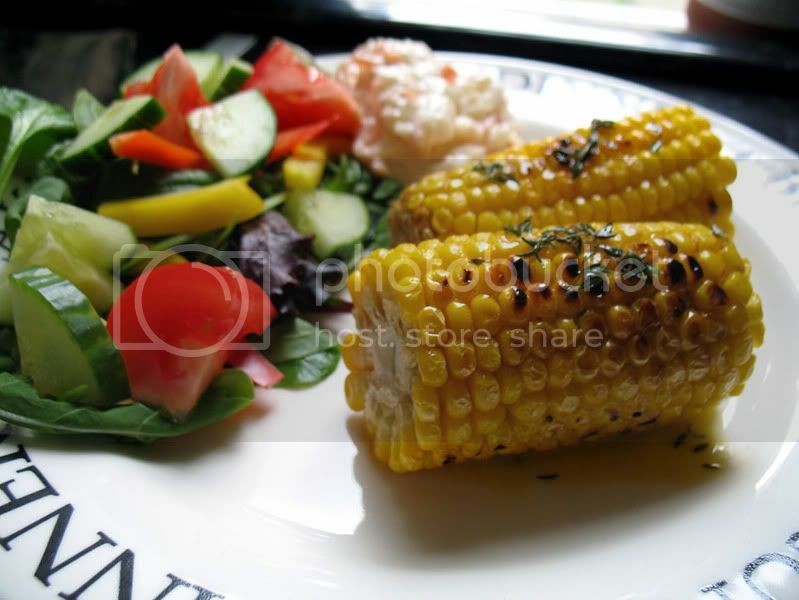 When the corn is done, remove to a plate and drizzle with the herb butter.